Sure there are a lot of embrocation products on the market, but for years my favourite product is good ol’ Tiger Balm. It’s cheap, I can get it at better grocery stores, and unlike a disconcerting number of cycling-specific embrocations, it doesn’t cause my skin to FREAKIN’ BLISTER. On cold days I’ll smear it across my knees mainly, and it protects against tendonitis. Actually, my left knee had been bothering me for about a week, and yesterday I rode with Tiger Balm on that knee for 3-1/2hrs in bitchin’ cold rain. I don’t know what my reasoning at the time was, but I didn’t use it on my right knee. And behold! The left knee feels great while the untreated right knee is just a little tender. 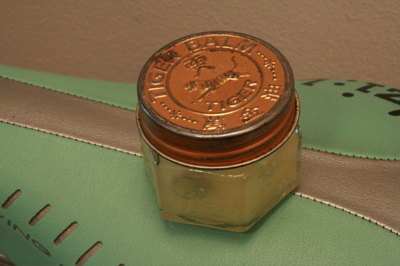 Sure, I prefer pricey Assos Chamois Creme, but I’m rather keen on Tiger Balm when it’s not my bum. It’s a bit greasy, but I actually think that attribute may help reduce heat loss from cold rain and spray. Also, my old teammates used to smear Vaseline on their knees during rainy criteriums with the idea that they would reduce road rash in the event of sliding out in a corner, so theoretically Tiger Balm should have similar properties. I’m using Tiger Balm “White”, but I’ve also used and the less greasy “Soft”. I don’t have a preference between the first two, but the “Soft” variety is less greasy and hence seems to wash off sooner.